Is your pet showing the signs of discomfort in his lower body, or has restricted mobility? If that’s the case, then he might be suffering from canine hip dysplasia. It’s a common illness in dogs, and often pooches with this disorder will develop arthritis. Fortunately, your four-legged friend doesn’t have to suffer. There are several treatments available, and food comes as a natural and painless solution. In today’s article, we will review the best dog food for hip dysplasia. It has the potential to elevate this condition and promote a healthy lifestyle. 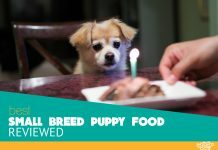 If you are looking for a brand which has a stellar reputation in per care industry, then Dogswell is the right choice for you. The carefully selected set of ingredients make this food our top pick. The chicken comes as the dominant component, combined with fresh vegetables and oats. Additionally, this recipe features glucosamine and chondroitin to improve mobility and maintain healthy joints. We should point out this nutrition is formulated for adult dogs. For that reason, it contains natural probiotics and prebiotics for the immune system and digestive support. When it comes to picky eaters, Dogswell Happy Hips will stimulate your pet’s nutrition and minimize allergies. On the other hand, blueberries and tomatoes represent a natural source of antioxidants. Overall, many pet parents reported this formula helped their dogs with weight management and improved physical activity. Large breeds are particularly sensitive to certain ingredients in dog’s food. For that reason, they require specially formulated nutrition which promotes bones and joints health. Luckily, Wellness Core Natural is one of them. This recipe will provide your pet with all the necessary nutrients to stay healthy and active. It features high-quality proteins such as chicken meat, as well as turkey and chicken meals. You will be pleased to know that Wellness Core formula doesn’t have cheap fillers or meat by-products. On top of that, your dog will have a chance to experience the WellFlex system for joint support. On the other hand, omega fatty acids, antioxidants and probiotics will stimulate digestion and boost the immune system. To conclude, to help your dog maintain an active lifestyle, make sure to test the Wellness Core recipe. If you are dealing with hungry and energetic canine, then Victor Performance will fulfill all his dietary needs. High-quality proteins are derived from beef, pork, and chicken meal, while natural sources or glucosamine improve the joint structure. Additionally, proteins will promote muscle development and supply your pet with much –needed energy. Even though it provides premium quality, this meal is quite affordable. Canines with food sensitivities will tolerate it as well. Recently, Victor Performance got a lot of attention because it doesn’t contain GMO grains and meat by-products. However, picky eaters might need some time to get used to this diet. In all, you are getting an excellent diel with Victor Performance recipe. It will not only improve your pet’s health but promote overall wellbeing. Hill’s Science brand has invested a lot of recourse in targeting various conditions in canines. 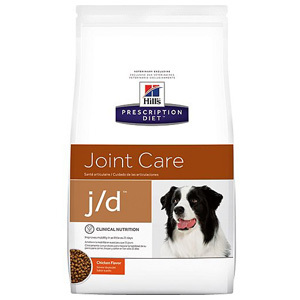 Therefore, Joint Care will help mature dogs who need to improve their range of motions and joint health. Even though the manufacturer makes a bold claim with this formula, many pet parents were able to experience the positive results within 21 days. The clinically proven combination of nutrients will have your dog running and jumping in no time. Let’s not forget this recipe is an excellent source of omega fatty acids and EPA. They will additionally nourish the damaged cartilage. Hill’s Prescription Diet features a controlled calorie content, while L-carnitine manages the weight. In summary, to purchases this formula, you’ll need a clearance from your vet. However, many pet owners said this recipe significantly improved their canines’ life. Royal Canin brand has managed to capture a lot of fans over the years. Same as the Hill’s Science, they’ve put a lot of time into developing specific formulas for canines. Additionally, their food is designed to target specific health conditions in dogs. Even though recipe contains grains such as soy, wheat, and corn, they don’t come as the first ingredient. Chicken and rice are principal ingredients, along with plenty of vitamins, minerals, and vegetables. Additionally, the fish oil and brewer’s yeast will stimulate healthy skin and coat, while glucosamine promotes joint care. Royal Canin recipe contains Chondroitin Sulfate which has a significant impact on cartilage and serves as a pain reliever. The bottom line, if you want to prevent coat and joint sensitivities, then Royal Canine recipe should be your next pick. It is a chronic condition where hip bones don’t develop correctly and over time partially dislocated. This is a common skeletal disorder in dogs, which results in arthritis. Healthy canines have a nicely hip socket rounded, and it’s big enough to fit the femoral head. These two bones should match perfectly. They are surrounded by strong ligaments, which are attached to the femoral head. Additionally, hip socket and femoral head surfaces are sleek and shielded by cartilage and fluid. These features allow painless motion. On the other hand, with dysplastic canines, the femur’s head doesn’t rest with the hip socket. So, instead of fitting correctly, it slides around the surface of the shallow hip socket. The ligaments aren’t strong enough, which causes the bones to dislocate further. In this case, the condition becomes extremely painful and make walking quite challenging. When the dog moves, the bones rub against each other, creating a lot of pain in the hip joint. Even though all canines can develop this disease, obesity and chronic illnesses are significant triggers. Some small breed such as French Bulldogs and Pugs are also prone to developing this disorder. It’s mostly a disease of purebreds, although it can happen in mixed ones as well. Researchers agree on the fact that it’s mostly a genetic disease. So, if a parent suffers from this disease, then the young ones are at high risks of developing this condition, as well. In some cases, a genetic component can be isolated. For instance, you can run tests for Labrador Retrievers, or apply exercise or other nutritional aspects to improve his condition. Many pet parents fail to neglect the initial signs of, which leads to bad breeding. This illness challenges not only canines but also their care providers. For that reason, you have to be fully involved in the recovery process. However, poor breeding doesn’t only involve the lack of care, but diet as well. If you are dealing with a dysplastic dog, then you have to feed him the appropriate recipes. Additionally, pay attention to his physical activity because moderate exercise has the potential to elevate the symptoms. In a variety of cases, it has been proven that obesity harms canines’ joints. Some dogs are genetically susceptible to hip dysplasia. For that reason, obesity poses a significant threat to their health. Another thing to focus on is the feeding schedule because it can promote rapid growth. When genetically susceptible are feed freely, they can develop this disease faster, then with a controlled diet. Decreased activity – this skeletal disorder makes pets less active than before. You may notice excessive sleeping and resting, as well as reluctant walking and running. Restarted ability to climb and jump – dogs are quite active by nature, but when they hesitate to run and jump, then something is wrong with their bones. Difficult rising – as the effects progress, the owners may notice difficulty in raising from the lying position. Pain and sensitivity – dogs with this condition may experience pain and discomfort when touched by a family member. Supplements such as chondroitin and dog food with glucosamine play a significant role in prevention and treatment. Nowadays, there is a specific dog food featuring these supplements. Additionally, you can add omega-3 fatty acids to his nutrition. It will promote mobility and elevate pain in some cases. If you resort to pure supplements, make sure to discuss this issue with your vet. Without a doubt, hip dysplasia is a stressful and painful condition. In most cases, veterinarians prescribe anti-inflammatory drugs to manage inflammation and pain. For some canines, additional pain medications might be necessary. However, they can’t stop the progress of the disease, only to elevate the pain. If you are looking for a long term solution, then you should resort to other options. Physical therapy might be another option to minimize the signs of this disorder. On the other hand, low impact activities such as walking, swimming, and jogging can help build up the muscles. As a pet owner, you should find the best method to help your canine live with this skeletal disorder. Additionally, you may use massage to decrease pain and enhance mobility in your pooch. Triple Pelvic Osteotomy – or TPO is usually recommended for pooches younger than two years old. In this case, the socket will be repositioned to create a tighter fit for the ball. Juvenile Pubic Symphysiodesis – this procedure is performed on puppies, even when there is no sign of this condition. However, JPB will be able to prevent symptoms and allow bones to develop properly. Femoral Head Ostectomy – in this case, doctors eradicate the ball and socket. When there is no contact, there is no pain. Usually, smaller breeds undergo this surgery. Total Hip Replacement – this is the most complicated procedure of them all, and it should be considered as the last resort. It often carries risk such as dislocation, infection, and nerve damage. Unfortunately, hip dysplasia is an incurable condition, and it has to be monitored. Many canines learn to live with this disease. However, they require continuous care. With age, it becomes worse. For that reason, pet owners need to check their dogs all the time. You should be able to notice signs of discomfort and pain. If you aren’t sure whether your pet suffers from this illness, then take him to the vet. As we mentioned before, diet and exercise may significantly impact your pooch’s health. On the other hand, they help with prevention and management. For example, a highly nutritious diet that contains a lot of supplements will support bones and help your pet move better. Additionally, if your dog already has dysplastic symptoms, then you should focus on mild exercise. However, if you are dealing with a healthy pooch, then regular exercise should be part of his routine. Breeding a dog is a huge responsibility and often starts before you pick the dog you want. Finding out about breeds nutrition is a crucial step you want to take. You need to understand his growing habits, to provide proper development. For instance, if you want to feed your pet with a high-calorie and high protein diet, then you should consult a vet. He will recommend an appropriate nutrition plan, which can prevent numerous health conditions such as obesity and weight gain. One of the solutions is moderate exercise and low-impact activity. For example, large breeds should avoid excessive jumping or any exercise that puts strains on their back legs. Fast forward, this can lead to deterioration of joints and speed up this disorder. You should consult your vet if you want to engage your pet into physical activity. He will advise you what type of exercise to apply. Is there a massage to help relieve pain? Yes, there are specialized massages which can manage pain in canines. First of all, you need to find a flat surface for your dog to lie down comfortably. Then carefully begin to apply pressure directly to the hip area, by using the pads of your fingers. The amount of force should be gentle, and your pet will let you know much he can handle. If you notice whimpering, stop immediately. Are heating pads safe for dogs? These days there are a variety of heating pads you can choose, and a lot of them come with resistance cords and temperature control. You can buy electrical or non-electrical option. Heating pads don’t pose a threat to your dog. Their warmth can ease joint pressure, as well as pain. On the other hand, it will help puppies feel warm during winter months. How long can a senior dog live with hip dysplasia? If managed well, this disease doesn’t have to affect your pet’s life span. With all the necessary treatments, medications and proper feeding of senior dogs, you can keep your canine comfortable. The lifestyle changes you make will additionally impact his condition and enable your pooch to lead a full long life. What home treatments/remedies can help a puppy with hip dysplasia? Water therapy – swimming is an excellent way to promote mobility in your canine. Hip dysplasia is a painful condition affecting the hip joints. However, water helps immensely and prevents tear and wear on the joint. Foam beds – these types of beds are beneficial for pooches suffering from this disease. They are made to be firm and minimize the morning stiffness upon getting up. Acupuncture – many dog owners resort to acupuncture to reduce pain in their pets. So far, numerous studies have confirmed the connection between the acupuncture points and peripheral nerves. In that case, this method can significantly relieve pain in joints. The surgical procedures regarding this skeletal disorder can be costly. For example, dog hip replacement cost anywhere between $5,000 and $7,000. Considering hip dysplasia is quite a common condition, a large number of canines are affected by this condition. However, to promote mobility and overall wellbeing, pet parents should consider a lot of aspects regarding the dog’s physical condition. In this article, we explained possible treatments, prevention, and causes, but we also emphasized the importance of nutrition. We hope our food choice will guide you through this journey and help your four-legged friend recover. In the case of proper care, he will be able to lead a long and healthy life.